I recently wrote a post about home-delivered snacks, but I’m a big proponent of homemade snacking too. After a visit to Fred Meyer a few months ago, I was inspired to try recreating a cubical little snack I found in their bulk bins: Coco Mango Pomegranate Chews. I did a little recipe modifying here and a little recipe renaming there and the result? Soft and Fruity Coconut Bites. 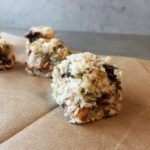 They’re essentially a sweet and chewy coconut base to which all manner of dried fruit, nuts, and seeds can be added. I chose dried mango, dried tart cherries, freeze-dried strawberries, and pumpkin seeds but I’d encourage you to change these up to fit your preferences. A soft, chewy sweet treat full of dried fruit and pumpkin seeds. Put all ingredients in a large bowl and stir to combine. You can use more or less brown rice syrup to get the right consistency. When you press a small amount of the mixture between your fingers, you want it to hold together. Line a 9-inch square pan with parchment or wax paper. Press mixture into pan. You want it very compressed so the bites will hold together. My trick is to cover the mixture with parchment or wax paper, place a second 9-inch square pan on top, put the whole mess on the floor, and actually stand in/on the second pan. I know it sounds crazy but it works compression magic that I can't get from just pressing down hard with my hands on the counter. Cut into 70 squares (10 across x 7 across). I like to remove them from the pan first and cut them on a cutting board with a very sharp knife. You can store them uncovered and they'll develop a pleasant dry exterior, or you can keep them in an airtight container and they'll stay soft like a macaroon. I tried making this recipe on a noticeably colder day and ended up with noticeably different results. The brown rice syrup was much more stubborn about being stirred in by hand. So I dumped the entire mixture into the stand mixer, mixed on low for about 30 seconds to 1 minute and ended up with a more uniform product. So this can be your back-up plan if the recipe doesn't work for you as written. I followed the lead of the original recipe and included some dry sweetener in addition to the brown rice syrup because it gives a satisfying crunch. My bag was labeled “organic turbinado raw sugar” and the only ingredient was listed as evaporated cane juice. But if you want to reduce the overall sugar in this recipe you can simply leave it out and they’ll still be plenty sweet. These are definitely a collection of energy-dense ingredients. Coconut, dried fruit and seeds, not to mention brown rice syrup, all pack a real calorie punch. So you’ll want to be careful with portion control. Luckily, with their sweet-tart flavor and perfect chewy texture, just a couple of bites can be quite satisfying, for only 120 calories. I’ve been enjoying them as an afternoon snack at work, or as a tiny bite of something sweet in my bento lunch box. But I bet they’d make a fairly sturdy traveling snack as well for long car trips or your favorite hike. I found the square shape appealing for some reason but these could just as easily be rolled into balls if that strikes your fancy. Or molded into trapezoids, pyramids, or rectangles. Once you get the mixture made, the shape possibilities are endless. 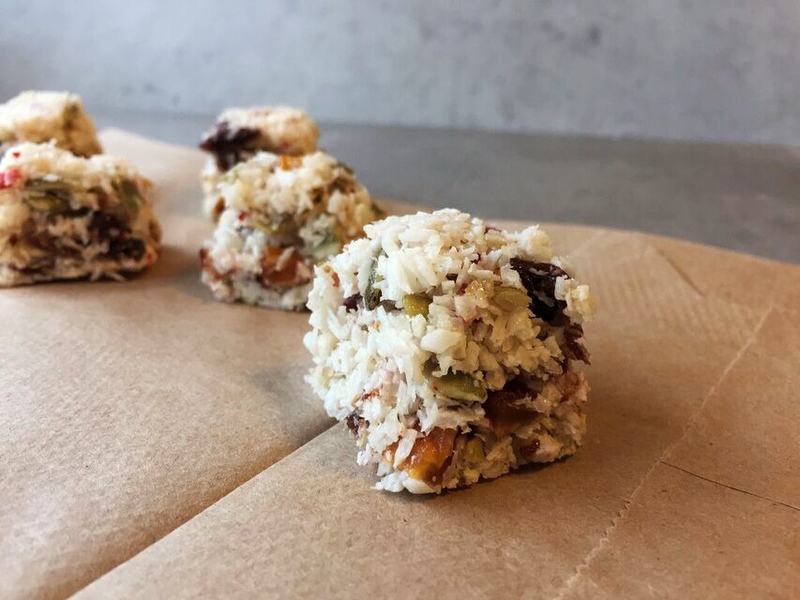 Whether they’re store bought, mail order, or homemade, having healthy snacks on hand can set you up for success with good choices throughout the day. When the hunger hits, you’re already prepared with a reasonable choice instead of being tempted by candy bars, chips, and cookies. 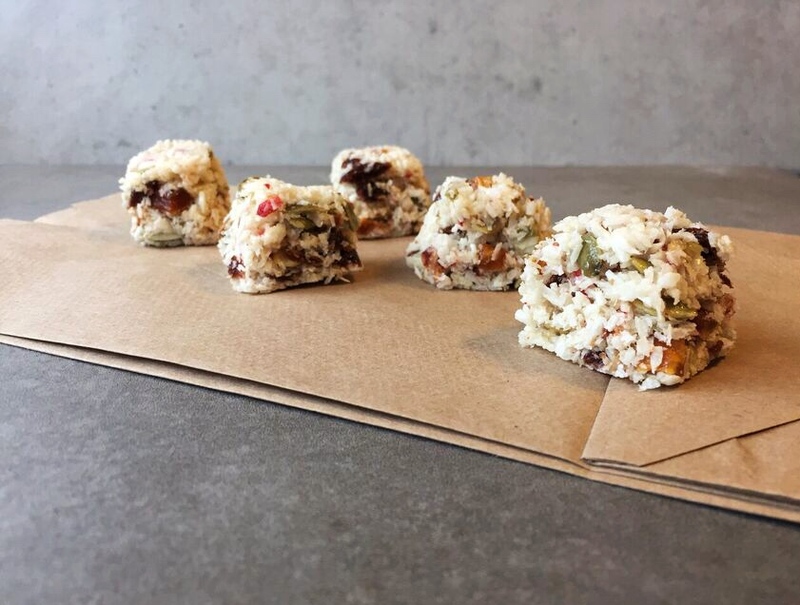 I’d encourage you to make a batch of these Soft and Fruity Coconut Bites this weekend and pat yourself on the back as you start next week armed and ready for the afternoon snack attack. 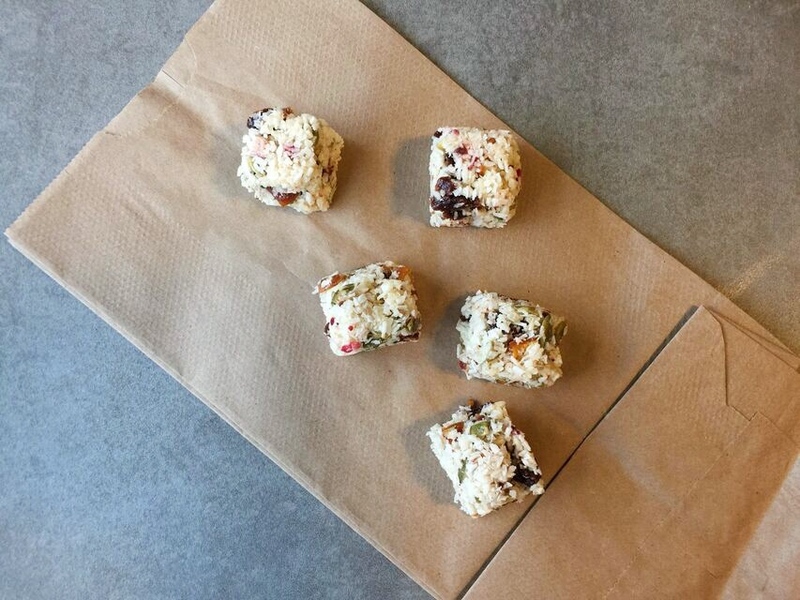 What combination of fruit, nuts, and seeds would you choose for your cubical coconut bites? Hi, I wanted to make these but can’t find brown rice syrup anywhere. Do you think they’d work with honey and/or maple syrup instead? And without the sugar? Hi Ana. It can be challenging to find brown rice syrup. I buy mine either at the food co-op or in the natural food section of my grocery store, which happens to be Fred Meyer. It would be worth a try with honey, but I can tell you that I’ve read several recipes for homemade granola bars that stated in no uncertain terms that brown rice syrup had the perfect consistency to allow ingredients to hold together without crumbling, which is why I chose it. If you use honey, it might help to keep them in the fridge to help keep them firm. I’d be interested to know what you find out if you try it! And it would definitely be fine without the added sugar.